The Featured Illustration is a Pen and Ink drawing, hand-coloured with crayon-pencils. This is Part One of a Project for the Barry Joel Gallery that I devised, consisting of a series of three pen and ink drawings made into cards and prints. 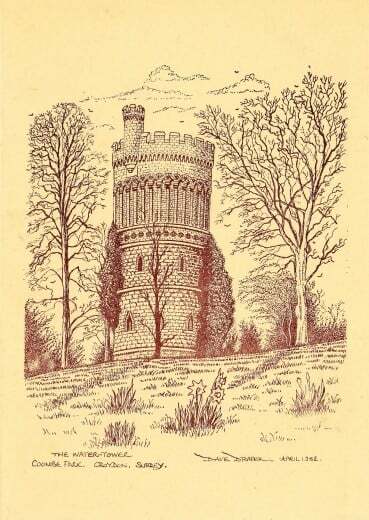 There is also an original A4 print of the Water Tower in black and white and a card version tinted sepia on a pale straw parchment background. 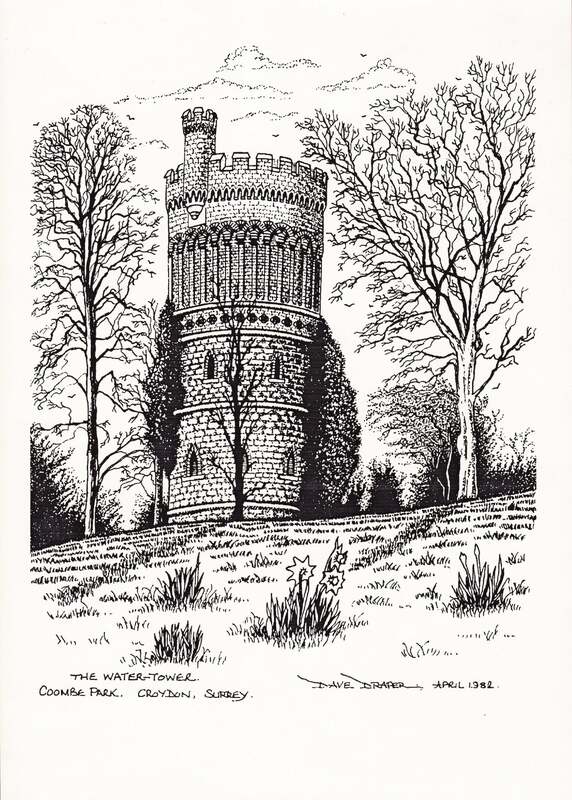 In April 1982, I took a trip up to the Coombe Cliff Gardens, intent on preparing a drawing of the Water Tower on Reservoir Hill. Described as Scottish baronial style by Barry Joel and Norman style in J.O.C. Ritchie’s account further down in this article, the Water Tower was built in 1867. Atop the hill beneath which the reservoir lay, the Water Tower stood 100 feet high and was designed by the engineering firm of Baldwin and Latham. Nonetheless, the reservoir proved inadequate and a new one was built on higher land at Addington Hills and the reservoir in Central Croydon was abandoned in 1923. A lot of pressure is required to pump water upwards, the more water, the more pressure required and the reservoir was just not far enough above sea level to meet increasing supply demands in Croydon. Except for a temporary revival as an emergency water supply for fire fighting purposes during the 1939-1945 war, the Water Tower thus became sadly redundant, though it did have an alternative use for awhile as some sort of local attraction where visits were made to the interior by the public, with a stairway leading up to the battlements, and a view out through the gaps in the parapet could probably make one feel like a knight in olden days. But those days are long gone, the town has been modernized in various waves and bursts and the tower has since fallen into disuse, though it still stands, an empty shell, and if you peered out from the top now you’d see all the modern skyscrapers and the illusion of some past idyll would be dispelled. It was for some time under considerable threat of being demolished, though somebody must have effectively raised a stink about that, for it’s now a protected heritage item. I was going to sketch the tower on site, but I took a colour photo instead. It saves being caught in the wind and rain and having your painstaking work ruined in seconds. Then I went back home made an initial pencil sketch from the photo and set about doing a pen and ink drawing in comfort. 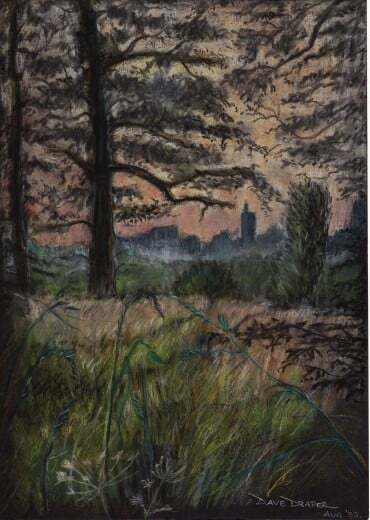 Barry Joel was interested in the finished drawing when he saw it, and asked me to do two others: St Peter’s Church and Sanderstead Church, which I did. I sold all three to Barry at his Art shop in Croham Road, South Croydon and he made the drawings into a series of cards and A4 prints. These were sold in various shops in and around Croydon. 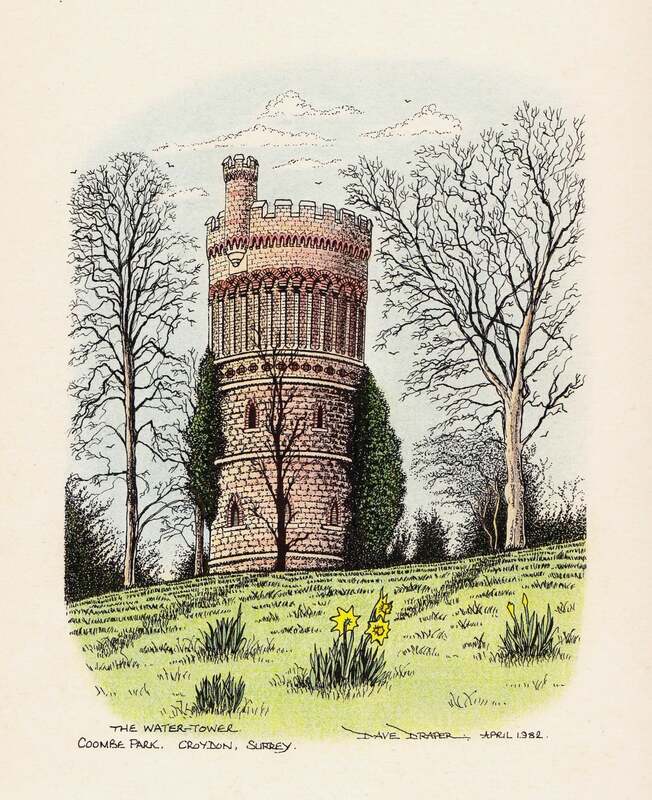 Having received a measure of complimentary cards and prints of the Water Tower from Barry, I set about individually hand-colouring some of the A4 prints, one of which I gave to my mother, several others to family members and various friends and a few I held for myself. One of these I mounted on card and set in a glass-fronted frame. It has been hanging on the wall of my front hallway for over thirty years. Since originally writing this, I have added to the slideshow a Twilit View of the Water Tower as seen from Lloyd Park, which was rendered in oil pastels in 1988. 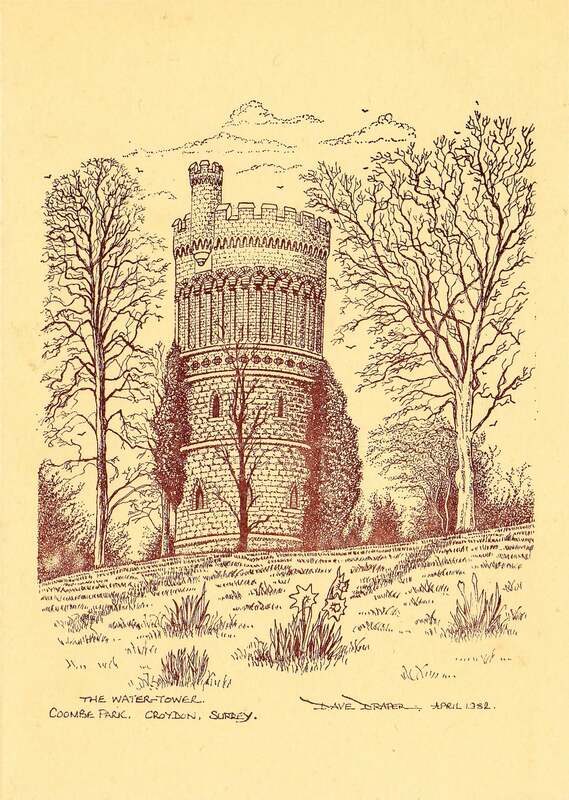 “Park Hill Water Tower was built in 1867 for the Local Board of Health to the design of the late Mr. Baldwin Latham, C.E., the engineer for the public works of Croydon, and although no longer in service, it has been retained by virtue of its architectural merit. 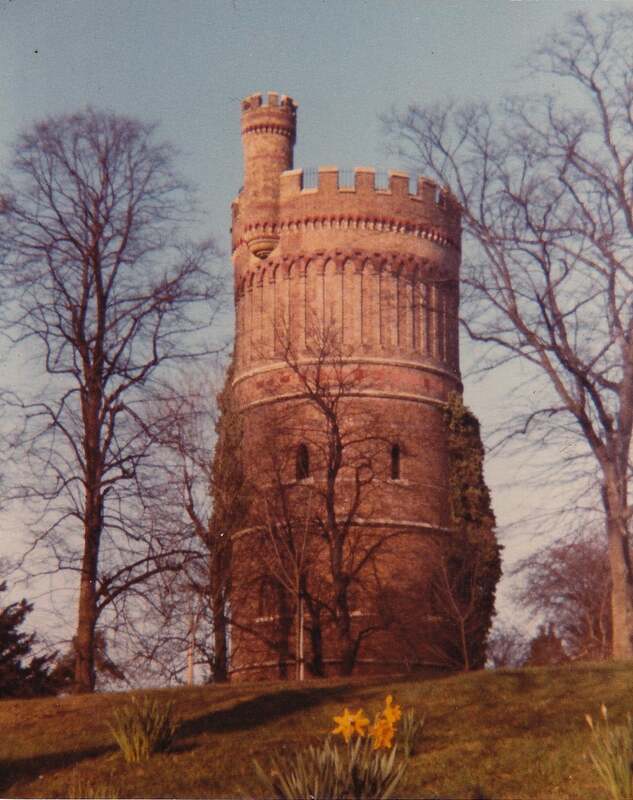 This 30 feet diameter tower is a 100 feet high terracotta brick building in Norman style containing a high-level cylindrical wrought iron tank of 40,000 gallons capacity, which is supported on cast iron girders with intervening timber joists as cushioning. walls of the tower which vary in thickness from 38 to 14 inches, and they are supported intermediately by three central columns consisting of cast iron flanged pipes, which also performed the function of the inlet, outlet and overflow pipes serving the tank. This page and its featured illustration, slideshow and textual information can be located in the Art Section of the Pulldown Menu under the Landscape, Architectural and Projects categories.